PLEASE BE SURE TO EMAIL YOUR BEST CONTACT PHONE #. WE CANNOT SHIP THIS ORDER WITHOUT THIS! This Professional Series Dual Motor Vibration Plate Machine burns fat and tones and tightens skin - Because of increased metabolism. The vibrations reshape the body in the hip, waist and abdomen. You can increase muscle tone, strength, circulation and flexibility in just 10 minutes a day, 3 times a week. Includes: Machine with all accessories, power cable, screws/tools needed for assembly, and the instruction manual. Leveling legs on the bottom make it easy to have it perfectly balanced to work on any floor. Assembly is very easy and takes about 30 minutes, 2 Year Seller Warrant (parts). Standard delivery is curbside delivery for residential addresses, via liftgate. Please read our Amazon storefront info and shipping policies, as it may not be possible for us to ship this item to your location. Dual Motors (Triangular Oscillation or Tri-Planer Spiral Vibrations), 1500 Watts (1000 watt and 500 watt for each motor), 60 Speed Settings for each motor, Upgraded noiseless motors. 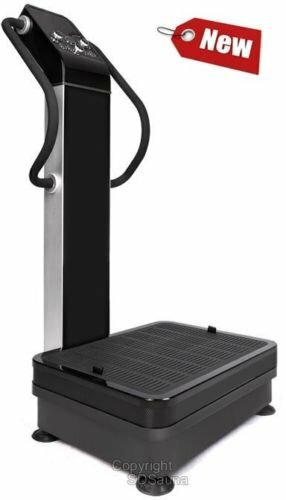 Upgraded Steel Tower, Arm Bands Included (Great for upper body workouts), Upgraded Advanced Digital Control Panel, Leveling legs on the base/bottom, Easy to read LCD Screen. Triangular Oscillation Amplitude (0-10mm), Triangular Oscillation Frequency (5Hz-15Hz), Tri-Planer Vibration Amplitude (2mm), Tri-Planer Vibration Frequency (15-40Hz), Maximum Weight: 400lbs. Power: 110v/60Hz, Includes: Machine with all accessories, power cable, screws/tools needed for assembly, and the instruction manual. Assembly is very easy and takes about 30 minutes, 2 Year Seller Warranty. If you have any questions about this product by WP Fitness, contact us by completing and submitting the form below. If you are looking for a specif part number, please include it with your message.